Who doesn't love food on a stick? And aren't they pretty? With the Memorial Day weekend coming up, I thought this would be a great first dish to blog about. The marinade was sweet and tangy and a perfect complement to the sweet peppers and peppery onions. You can put together so many different combinations of veggies for this. 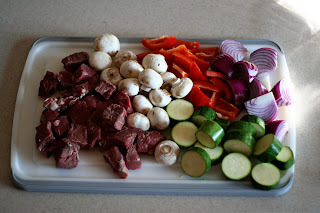 I chose mushrooms, red onion, zucchini, and red bell peppers. The most important thing to remember when making kebabs is to keep everything approximately the same size. If you slice your zucchini too thin it will turn to mush before your onions are cooked through. I like to use sirloin for kebabs but you can use any cut of beef, really. I think the sirloin has the right amount of fat marbled in to keep it from drying out. I like to marinate the entire kebab rather than everything separately. After you assemble them, place in a large baking dish. Pour the marinade over everything making sure each part is coated well. Cover with plastic wrap and place in the refrigerator for 6-8 hours. I rotated them in the dish every few hours just to make sure they were equally coated, but I don't think that is absolutely necessary. Another thing to remember when making this kind of kebab is to grill them slowly. You want to make sure all the vegetables are cooked evenly. You don't want crunchy onions, mushy zucchini, and over-cooked steak! For the marinade, combine all ingredients in a small bowl. Set aside. 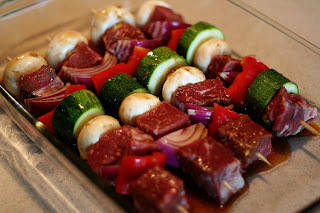 Thread 1 meat cube onto skewer, followed by the remaining ingredients until skewer is full. Place into a large baking dish and pour marinade over skewers. Cover with plastic wrap and place in the refrigerator for 6-8 hours, or overnight. Preheat grill to medium heat. 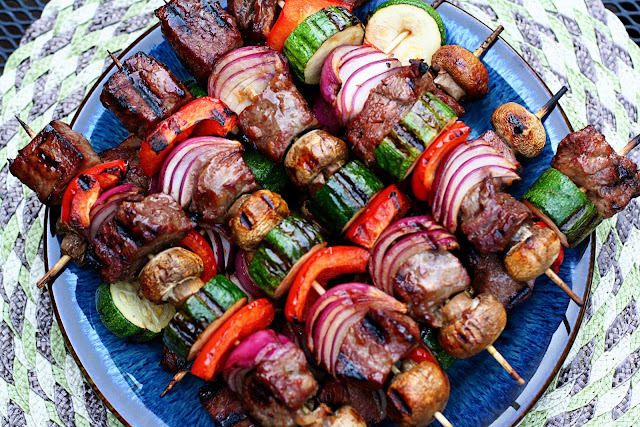 Place skewers on the grill, rotating every 5-7 minutes until cooked to your liking and all veggies are done.